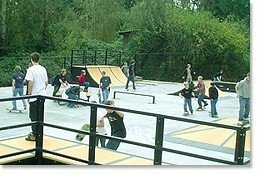 164th AVENUE SKATE COURT - Covington, Washington, U.S.A.
stair and a ledge. It also has a movable 3 foot spine ramp and a bench. fully usable feature is the double half pipe. Go early and skate it.